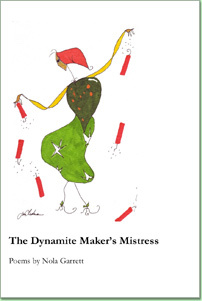 The poems of Nola Garrett's The Dynamite Maker's Mistress are so energetic in their lines, so varied in their subjects, and so intense in their emotions, that one almost forgets that they are written in one of the most stringent of forms: the sestina. Nola Garrett is Faculty Emeritus of Edinboro University of Pennsylvania. She lives in Palm Harbor, Florida, with her husband, Ronald. Her poems, Macedonian translations, and essays have appeared in Able Muse, Arts & Letters, Christian Century, Christianity and Literature, FIELD, Georgia Review, and Tampa Review. Her chapbook, The Pastor's Wife Considers Pinball, won the 1998 American Poets Prize. She has received a Residency at Yaddo, and Scholarships from the West Chester Poetry Conference and the Bread Loaf Writers' Conference. ISBN: 9781934999455, paper, 84 pgs.